The other day I was writing about things I have been eliminating from my diet, and I mentioned that I have not been using much salad dressing recently. 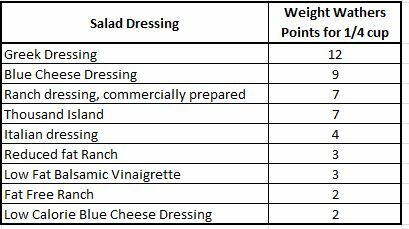 The reason I have been staying away from salad dressing is that it has quite a bit more calories, and Weight Watchers points than you might think. I tend to have lunch in diners a few times a week. In the region where I live, these are generally called Coney Islands. They serve a variety of Greek dishes, Chili Dogs, omelets, and the like. They also tend to have great soups and salads. When I order a good sized salad, they bring it out with two ramekins of dressing. I checked the other day, and at one of the diners the ramekin size is 3.75oz. That is nearly ¼ cup. And, they usually bring two. In the past I would have used all of one, and most of the other, which means I was using upwards of ½ cup of dressing. Most of these totals came from the Weight Watcher Application. For the Greek Dressing I looked up what a typical bottle of dressing would have for the nutrition label, and ran it through the WW calculator. Keep in mind that these totals are for ¼ cup, and many places give much more. What starts out as a healthy, low point salad, can quickly turn into a 20 point nightmare just from adding the wrong dressing. This chart isn’t meant to be an exhaustive list, and your favorite might not be here, but it does show a cross section of common dressings. Note that I have Balsamic Vinegar, which is different from Balsamic Vinaigrette dressing. Most of the time I now reach for one of these on my salad. As I had written the other day, Frank’s Red Hot Sauce is a nice alternative, especially if I am including grilled chicken on the salad. It adds a nice kick, and doesn’t add points. Beware, adding Frank’s to some grilled chicken is not the same as ordering a buffalo chicken salad at a restaurant. Usually those include breaded and fried chicken, and the sauce isn’t pure Frank’s. It will include butter or some other agent to help the sauce stick to the chicken. So, there you have it. My take on salad dressing and having an alternative. It amazes me how salad dressing choices can make you or break you. When I don’t have time, or forget my lunch, I frequently stop at our local Hyvee grocery where they have an awesome salad bar. I have had good luck with Hellmann’s Balsamic Vinagrette and Sun Dried Tomato Basil Pesto for 2-3 pp for a 2 T serving.